Descendants of Captain John Whipple have wondered in vain who the teenage John Whipple that arrived in Dorchester, Massachusetts, aboard the Lyon in 1632 might be. 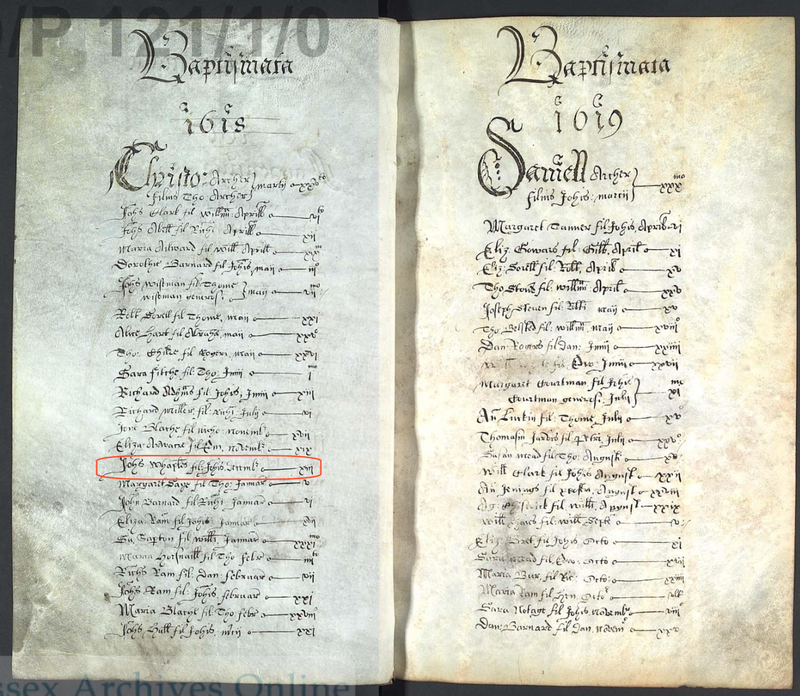 Marked in red on the left page above, the Latinish entry translates to something like "John Whaples, son of John, December ---- xiii"
In my books on the Whipples on page 2 it states, "It is assumed that John was born around the year 1617. Debrett uncovered the name of only one individual whose christening was close to that date. His name was John Whaple, baptized 13 December 1618..." Debrett sent me that information in 1990 long before the Fiske article appeared. Perhaps Fiske's guess was wrong, and the two families are not related. John Whaple could have spelled his name Whiple at one point in his life? As you are aware, even the educated spelled their names in a variety of ways. Or as was typical at Ellis Island, the immigration authorities could have misspelled the name. Whiple, Whipp, Whippe, Whippill, Whipples, Whippul, Whippull, Whippyll, Whitell, Whittell, Whittle, Why___, Whyple, Whyppell, Whyppill, Whypple, Whyppull, Whyppul, Whyppyle, Whyppyll, Whyppylle, Whypull, Whypyll, Whytell, Whytle, Wibell, Wippell, Wippill, Wipple, Wipples, Wivell, Wyphyll, Wypple, Wyppull, Wyppyll, Wyppull Wyppyll, Wyppylle, Wytill, Whappill, Whelple, Whelppeley, Whepoelle, Whepells, Whepill, Whepille, Whepilles, Wheple, Wheples, Wheppell, Whepple, Wheppyl, Whepull, Whepyl, Whepyll, Wepell, Weppull, Wepull, Wepyll, Whatell, Whapells, Whaple, Whaples, Whaplet, Whaplett, Whapole, Whappell, Whappells, Warpell, Warple, Waupoull, Wauppoull, Waypole, Waypoole, Waapulls, Walbe, Walepell, Walple, Walpole, Walpoole, Wapell, Waple, Waples, Wapolle, Wapoole, Wappell, Wapple, Wapples, Wappoll, Wappoull, Wappull, Wapull, Wapulls. Much of the research of Blaine and Charles Whipple (noted above) has focused on attempts to find a biological relationship between Captain John and the Bocking/Ipswich Whipples. That research has failed (so far); additionally Y-DNA tests have failed to show any connection. This blog post asks if John Whaples of Great Waltham, Essex, County, England — though not necessarily related to the Bocking Whipples — might be the same person as the teenage John Whipple who arrived as an Israel Stoughton's indentured servant aboard the Lyon in 1632. To further that investigation, I have added John Whaples to the Whipple Genweb at https://whipple.org/159672, together with his relatives that I could glean from the appendices of Blaine's 15 Generations of Whipples. As you click the links to his relatives, I invite you to scroll to the bottom of their pages to read the comments and wills. You will notice that John Whaples' father and brothers omit mention of John in their wills. He seems to have "disappeared" (without a trace?) by the time they wrote their wills. Did John "disappear" to America, I wonder? If you can make a connection, let me know!